We speak to geneticist Donagh Berry about the use of genomic bulls as part of the breeding programme for your farm. Firstly, Donagh explains what genomic selection really means and how it compares to the traditional method of selecting daughter proven bulls. Donagh explains that the milk production, fertility, longevity, and consequently profit is greater in offspring from genomically selected sires than daughter proven sires. 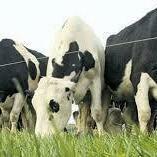 Interestingly, over 70% of dairy straws sold in Ireland are from genomically selected bulls. Finally, Donagh considers the potential benefits of genotyping your dairy females and whether the benefits outweigh the cost.